Police were investigating another robbery near San Diego State University’s campus Saturday. Dispatchers received a report just after 11 a.m. that a purse had been stolen at knifepoint in the 5000 block of 63rd Street, San Diego Police Officer Steve Bourasa said. The area is fewer than 1,000 feet from campus. Police searched the area but were unable to locate the suspect. He was described as a man in his early 20s, 5-feet-9, wearing black shorts and a light-colored shirt, Bourasa said. It wasn’t clear if the victim was a student or was injured in the robbery. Saturday’s incident is at least the third robbery near campus in a little more than two weeks. 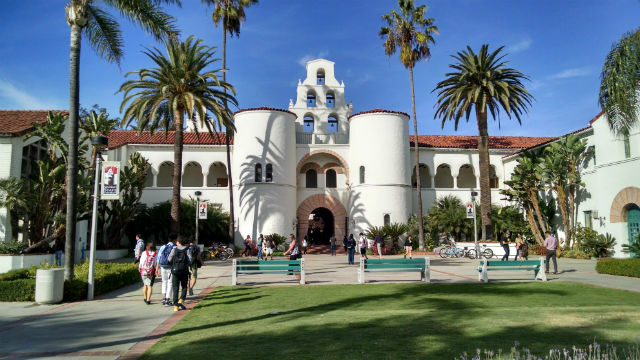 In the early morning hours of Aug. 24, multiple men reportedly stole three cell phones and a pair of keys from a group of three SDSU students in an area south of campus. On the evening of Aug. 27, two suspects were believed to have stolen another phone out of the hands of a student near dorms along College Avenue and Lindo Paseo.